It seems in recent times the anthology movie is having a bit of a comeback, this is great for indie film makers as they get to try and showcase their works in the hopes of securing (possible) funds for later projects. 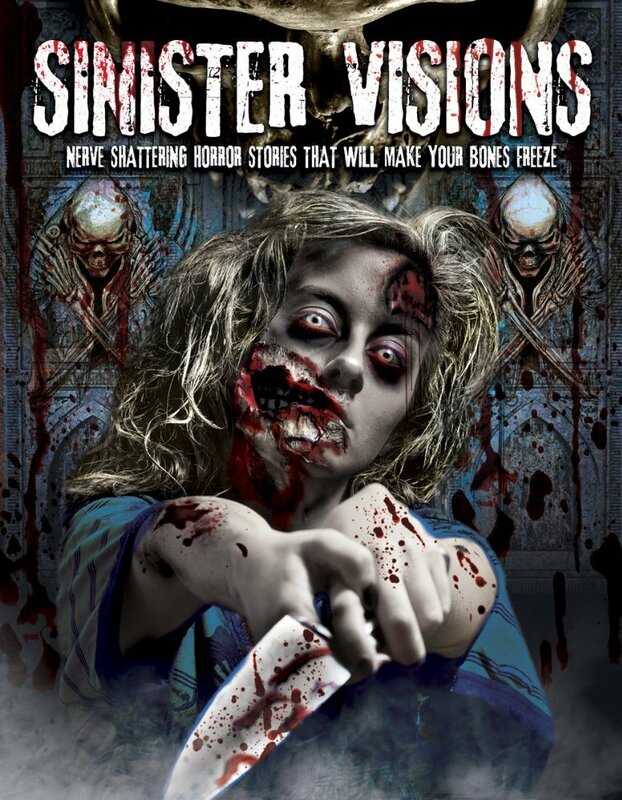 Thankfully the stories contained in SINISTER VISIONS are shorts and should stay as such. That is not to say they are bad but they certainly aren't doing anything we haven't seen before. So what do we have in this anthology movie well first off we start with Succubus, a story of a woman who is out on an expedition and discovers a relic. On examining it she drops it and the gas within enters her, this gas is in fact a demon. Now possessed by the demon she goes in search of male company to satisfy her sexual desires. This is a pretty good start to the film and the sfx of the succubus are well done. We then move into zombie territory with a couple of even short shorts, one involves some found footage of a scientist who gets attacked by zombies. Some decent humour in this one, we then move onto an advert for a product that could help you keep your loved ones with you safely even when they have turned into zombies. Probably the best story of the whole film is My Undead Girlfriend where we see a man heavily in debt having to marry his rich girlfriend who has turned into a zombie. Of course he has to meet her parents and explain her off appearance to them as just a wild night out partying, but its not long before she goes berserk. There is some comparison to early Peter Jackson work right down to the humour. Next up is the dull short PSYCHO rip-off Mother Knows Best which sees a man being controlled by his dead mothers voice to not sleep with woman. Moving on we come to A Woman Scorned, a tale of a woman who's partner has cheated on her and she kidnaps both of them and punishes them before walking off into the sunset. This one would have worked great as it did have tension, but the woman playing the scorned ex was entering pantomime territory with her acting which ruined it a bit. Last is Genital Genocide where we meet a serial killer on the electric chair talking about all his horrendous crimes which we see in flashbacks. The guy playing the killer was great and had a real presence about him. 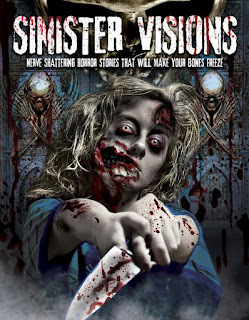 What could have made SINISTER VISIONS a lot better is if it had a wraparound story that brings everything together but instead we have a mixed set of shorts cobbled together to form a feature film. The directors do a good job considering the budget they had to deal with and thankfully each story doesn't stick around too long. Ultimately this is worth checking out only if your a completist and want to see all anthology movies ever made.